Poppy's life has been turned upside down after her grandma (and guardian) had a stroke and ended up in the hospital. But Poppy is working on a plan to help Grandma Beth so their life together can go back to normal. But when she witnesses an armed robbery, "back to normal" slips even further out of her reach. 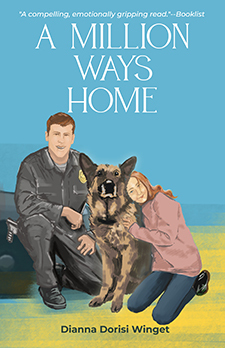 To keep Poppy safe, the budget-strapped police devise an unusual "witness protection program," wherein Poppy will stay with Detective Brannigan's mother. Soon Poppy is feeling almost at home, even making sort-of friends with a girl named Lizzie and definitely friending Gunner, a beautiful dog with an uncertain fate. But it's still not home. So while she and Lizzie navigate a rocky friendship and plot to save Gunner's life, Poppy also tries to figure out a new plan to save Grandma Beth and their home, all while avoiding a dangerous robber who might be searching for her. But what if Grandma Beth can never come home and the robber is put behind bars? What will happen to Poppy then? "A story full of strong characters and emotions . . . the crime element adds suspense and a thrilling conclusion." "I have read some emotionally powerful books this year, and I believe at the current time this one takes the cake." "Absorbing . . . Winget weaves in enough suspense, emotion, and subplots to keep interest high." "I received a copy of your book at Book Expo and passed it on to a reluctant sixth grade student reader. She enjoyed the book very much and told all her friends to read it." "All the pieces come together for an emotionally satisfying read."